Philadelphia’s Cathedral Basilica of Saints Peter and Paul was the backdrop for a special mass by Pope Francis on September 26th. 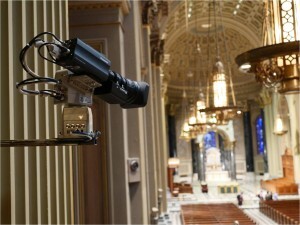 The mass, which was broadcast live to the 2,200 congregants as well as to viewers worldwide, was captured by new technology that Cenero helped put in place. 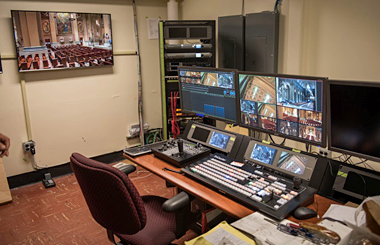 Cenero worked with Daniel Kearns, technology specialist to the Communications Office of the Archdiocese and Joe Pagano of RGB Broadcast Video Service to determine the best way to update the 150-year old Church with the latest video production system to capture the important event. All new technology was unobtrusive, the cameras could not be noticed during the celebration of mass and the wiring was concealed in the walls. 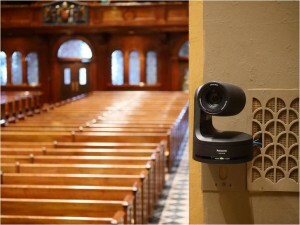 Panasonic remote production pan/tilt/zoom cameras were chosen because they featured discreet movements that would not disturb the congregation. Two large screens and two camcorders were also placed in the Cathedral to help capture all aspects of the mass.